Disclosure: I received products in exchange for an honest review which I’ve given. If you’re like me, you’ve got scents in your house that you’d love to remove! I just said to the dog that he is smelly! If you’ve got a dog, you know what I mean. That doggy smell permeates the air and furniture at times. I’d never give him up, so I’ve got to find a way to neutralize his odors. 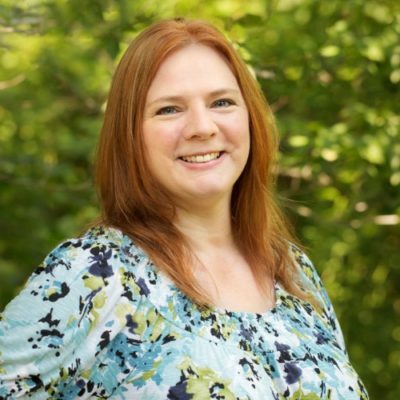 I’ve also got 3 cats and 3 gerbils….and two kids! Smelly animals, smelly shoes, smelly kitchen odors….whatever odors are in your home, Renuzit Sensitive Scents can help. 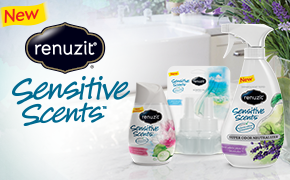 Brand new from Renuzit, Renuzit Sensitive Scents are a unique sensory experience. They are available in three refreshing scents: Pure Water Blossom & Cucumber, Pure Ocean Breeze, and Pure White Pear & Lavender. These scents have been created to ensure effective, long-lasting and pleasing scents without being too overpowering. 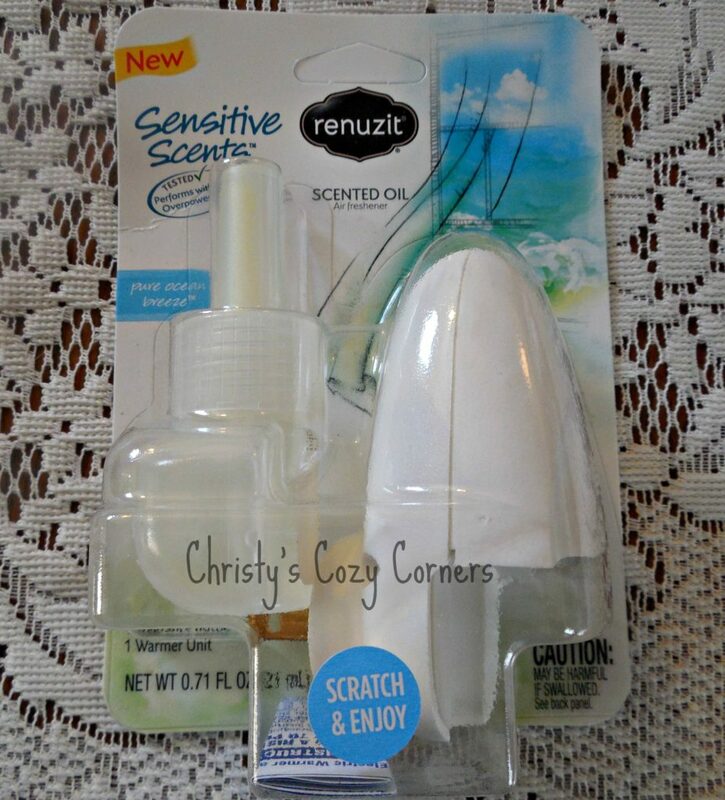 Renuzit Sensitive Scents are available in adjustable cones, universal scented oils (they fit any Glade or Air Wick oil warming unit), and trigger spray bottles which can be used on fabrics or in the air. 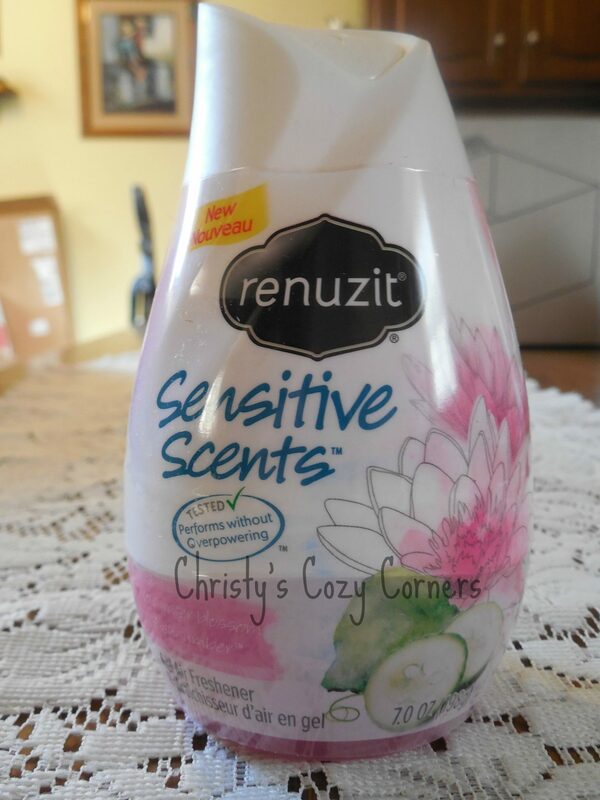 This Renuzit Sensitive Scents adjustable cone in Pure Water Blossom & Cucumber smells so good! I put it up by my gerbils cage to help with the odor that they can create. It helps neutralize without being overpowering. I love that these Renuzit Universal Scented Oils can fit into multiple warming units! This Pure Ocean Breeze has a light and airy scent that you will love. I put this one in my kitchen! 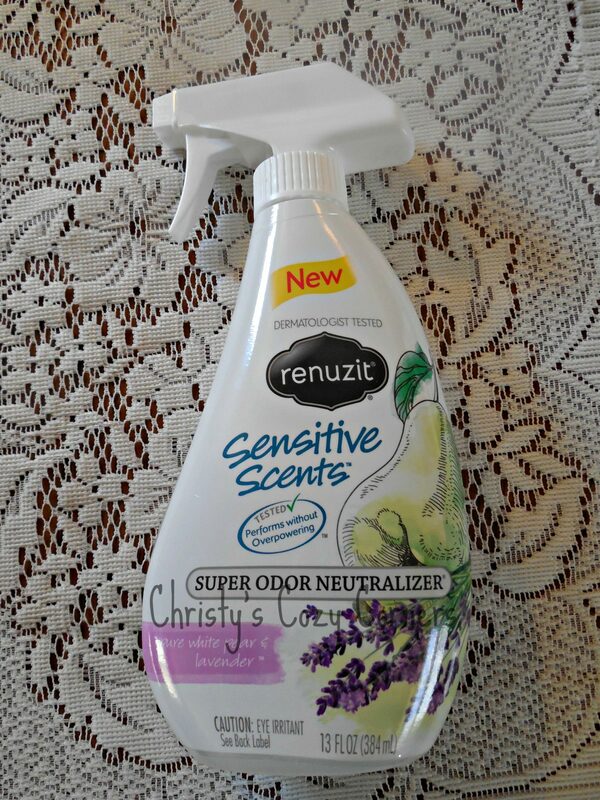 I really like the soft scent of the Pure White Pear & Lavender Trigger Spray from Renuzit Sensitive Scents. It smells very sweet and definitely helps with the doggy smells in the sofa! I would choose the pure white pear and lavender because I think it’s such a unique combo with two scents that I really like. Thanks for hosting! I would chose the Ocean Breeze scent because it sounds light and refreshing. Pure White Pear & Lavender because that sounds the most relaxing to me. I would love the scent Lavender because it has such a fresh odor. I would choose the White Pear and Lavender because I love fruit scents and Lavender always sounds soothing and comforting,so both of them combined would be heavenly. I would pick the Water Blossom & Cucumber scent. I’d love to try the Pure White Pear & Lavender. Lavender and White Pear sounds like it would be a pretty scent. I would get the Pure Ocean Breeze as I love the ocean and always want to be there. I would love to try the Pure Water Blossom & Cucumber, it sounds so fresh and clean! I would want the pure ocean breeze scent because it is similar to what we already use. I would choose Pure White Pear and lavender if I won, I love lavender and the addition of pear sounds like it would smell even better. Pure Water Blossom & Cucumber is my favorite because this combination scent sounds fresh to me! I would choose the Hawaiian Oasis because I love island scents!